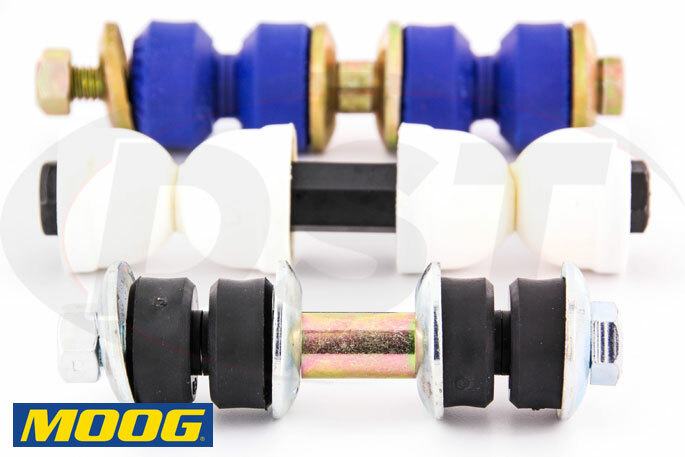 These Rear Sway Bar End Links from Moog will replace worn or damaged OE end links and restore the rear sway bar's ability to control the body "roll" (or lean) your vehicle experiences during a turn. Find the rear end links that fit your vehicle below. The rear end links connect the sway bar to the rear wheels which keeps the tires flat during a turn providing better traction. When the rear sway bar links are worn or damaged you can experience symptoms like increased body roll, clunking noises from the bar banging around, or a loose feeling in the way your vehicle handles. Replacing the old end links is a simple DIY process and new end links from Moog can improve handling during a turn. Moog manufactures end links that can serve as ride-restoring direct replacements or performance-enhancing upgrades. The difference is in the material of the grommets which range from comfortable Rubber, more durable Thermoplastic, and handling enhancing Polyurethane. Those with rear Ball Joint Style End Links can also find their part from Moog and replace worn OE links. * If you're having trouble finding exactly the right size or style you can check out Moog's Universal Sway Bar End Links which will provide exact measurements of end link dimensions to show you the part you need. ...new end links from Moog can improve handling during a turn.